KIKI MELENDEZ – ACTRESS, WRITER, DIRECTOR & PRODUCER An award-winning comedienne, Dominican-born Kiki Melendez has been entertaining audiences for years in both the Spanish and English language media markets. Kiki first got her start in NYC’s coveted morning radio format in 1995 at LA NUEVA FM 105.9, a non-rated station that due to KIKI’S LOCOS Y CONTENTOS MORNING SHOW, began earning share of audience; leading Heftel to buy the undiscovered signal. She then proceeded to do the same in the LA market, becoming the first female morning lead host on KRLA and Groove 103.1 FM. 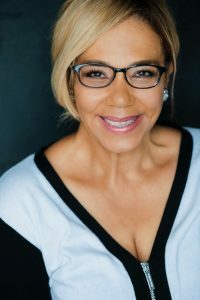 Kiki was subsequently discovered by Galavision National Cable Networks and had the first bilingual show in America, “KIKI DESDE HOLLYWOOD,” the #1 entertainment show at the network, which quickly made her a household name amongst Hispanics. Kiki’s Showtime Network Comedy Special, “KIKI MELENDEZ’ HOT TAMALES LIVE” was also a hit – airing over 400 times in three years (2009-2011). In 2014, she also produced the TV show, “LOCOS Y CONTENTOS” for Lieberman Broadcasting. Produced in the tradition of SNL and MAD TV for Latinos, this was the first time this genre had been produced for the U.S. Hispanic TV market. The first special, which aired on Oct 10th @ 8 PM on National Estrella TV earned a 1.7 rating – coming in at #2 only to Univision, in it’s time slot. (Note: Estrella TV has a highly limited HH Distribution compared to competitors). In addition, her feature docu-comedy, JOURNEY OF A FEMALE COMIC a humorous tale of her trajectory in Hollywood, was Oscar qualified in 2015.